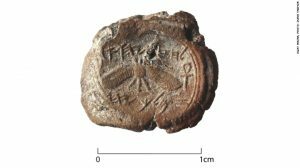 Under Solomon, Israel was a strong united kingdom. But when Solomon died, two of his sons divided the kingdom of Israel between them. At least that’s what the Bible says. Certainly Israel really split into two different kingdoms around 900 BC. Israel was in the north, and Judah was in the south. This was the time of the prophet Elijah. You might think that foreigners would conquer the Jews if they split themselves up in this way. Each half would be weaker than the united Israel. But at this time the Assyrians ruled most of West Asia, and the Assyrians were satisfied to get tribute from the Jews, without really conquering them. On the other side of Israel, the Saites ruled Egypt. But they were from Ethiopia in the south. So the Saites were not so interested in conquering in the north. The Bible doesn’t talk too much about the Assyrians, but it does mention (in the second book of Kings) an Assyrian king who gave 6000 gold pieces to have his general cured of leprosy. But in 722 BC, the Assyrians did attack. They conquered the northern Jewish kingdom, Israel. The Assyrians forced the Jewish people who lived in Israel to move to other parts of the Assyrian Empire, in small groups, to keep them from revolting. Nobody knows exactly what happened to these people, but probably they gradually gave up being Jewish and married people in the towns where they ended up, in what is now Syria and Iraq. The Assyrian king, Shalmaneser V, moved a lot of Assyrian people into Israel, where they gradually became more and more like Jewish people. The Bible calls them the Samaritans. Meanwhile, the kingdom of Judah, further south, kept on being independent until the 600s BC, when there was a lot of fighting between the Egyptians and the Babylonians over who would control the Eastern Mediterranean. Then Judah became part of the Babylonian Empire. Cite this page: Carr, K.E. Judah and Israel – Bible stories. Quatr.us Study Guides, August 24, 2017. Web. April 20, 2019. The Assyrian captives migrated to Amoorika ie Land of the Moors; Amaruca ie Land of the Plumed Serpent; II Edras 13:40-45 Arzareth ie Arzot haBrit aka Land of the Covenant aka Turtle 🐢 Island. Sorry, but this is all nonsense, not history. 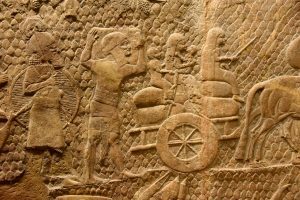 The Assyrians took the people of Israel as prisoners of war and resettled them in towns throughout their empire, where they assimilated to the rest of the population and lost their Jewish identity. There’s no more to the story than that.